Sean Hunt, a Queen’s graduate with a BSSc in Business Admin (1984) and a Postgraduate Diploma in Accounting (1985), has been recognised as the First Trust Bank Queen’s Alumni Volunteer of the Year 2017, at the ‘black tie’ Charter Day Dinner, held on Friday 24 November. Delivering the citation, Ian Moore, Head of Alumni Relations and Annual Giving, singled Sean out for his help launching Queen’s City Leaders and the Queen’s City Scholars Programme, his sustained commitment to the programme over the last five years, and his ongoing support for those students fortunate enough to be placed with him. “Sean played an integral role in the launch of the group which came together to help Queen’s students learn more about careers in Capital Markets, Finance and Law in London and to give them the support needed to raise their ambitions to think globally,” said Ian. Born in 1962, Sean Hunt is currently a Partner in TFC Investment Management, a company he established with 2 colleagues in 2011. Previously he headed the Global Markets Institutional Client Group for Credit in Deutsche Bank in Europe. He started his career with PwC in their Belfast, New York and London offices, later moving to Bankers Trust which was acquired by Deutsche Bank. In 2012, Sean agreed to give back to his alma mater by becoming a leading figure in a new group called the Queen’s City Leaders. The programme offers students one week business observation within a major global firm in London at the end of their first year, an experience that often gives them the springboard to kick start their careers. Ian Moore continued: “Sean has secured the highest number of placements for the scheme by providing opportunities in his own company and securing additional slots through personal contacts in other organisations. “He has also shown a real commitment to the students he has hosted by becoming a long-term mentor, supporting them to secure international placements in subsequent years, and helping them succeed in their chosen professional career paths,” he added. In addition to volunteering time to Queen’s, Sean has supported a number of projects at the University, including Executive Education at Riddel Hall and the McClay Library. He has also used his extensive networks to make corporate introductions for senior academics in the Institute of Global Food Security and more recently, offered his time to support the domestic student recruitment team with their UK strategy, with a specific focus on London. The City Leadership Group organises and offers Queen’s undergraduate students an opportunity to sample business boardrooms at the highest level. The scholarships provided include a financial award, practical support and advice, tailored networking and professional development events, and an opportunity to access the CLG. Married to Mônica, Sean's siblings – Olive, Niall, Kieran and Patrick – are also graduates of Queen's. For further information on volunteering at Queen’s please contact Natasha Sharma, +44 (0)28 9097 3135. 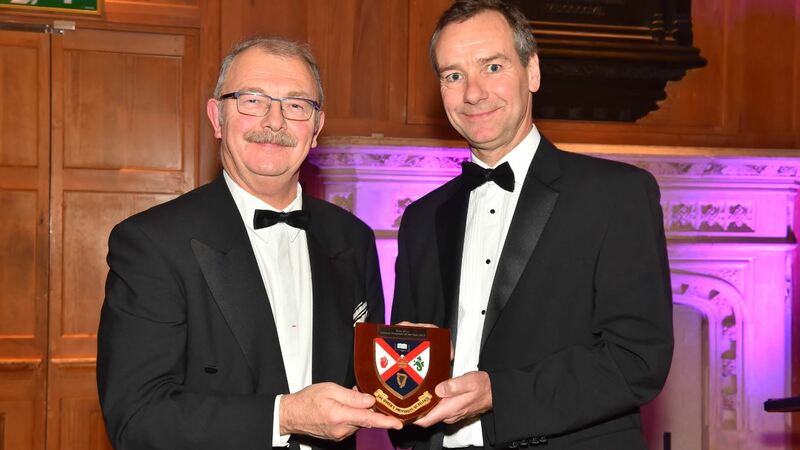 Caption: Sean Hunt (above right), was presented with the First Trust Bank Queen’s Alumni Volunteer of the Year Award by the Acting Vice-Chancellor, Professor James McElnay in the Great Hall at Queen’s.